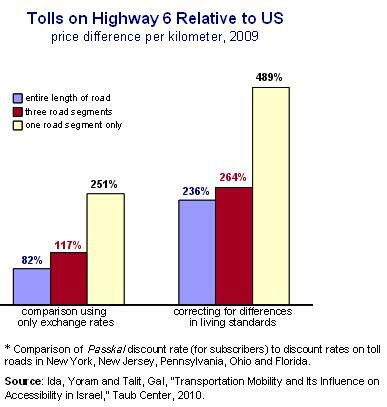 Israel’s Highway 6 is appreciably more expensive than comparable U.S. toll roads. The toll road traversing Israel from north to south was opened in 2002. Since then, traffic on the road has greatly increased, and the road itself has been widened and extended. The mission of Highway 6 was to draw traffic from other central arteries and reduce congestion on them – and to reduce the travel time from the north to the south of Israel. After the road opened, the Derech Eretz Company which operates the highway claimed that the tolls were low in comparison with toll roads abroad. Yet, in comparisons that Dan Ben-David made in 2003 and again in 2005 against five major toll roads in the United States (in Florida, Ohio, New York, New Jersey, and Pennsylvania), it turned out that the cost of driving on Israel’s Highway 6 was notably more expensive than the U.S. average. In a study recently published by the Taub Center, “Transportation Mobility and Its Impact on Accessibility in Israel: A Comparative Study,” Yoram Ida and Gal Talit revisit Ben David’s comparison. While the methodology used in the Ida-Talit study differed slightly from Ben-David’s, the authors found that there are still very large differences between the tolls charged in Israel and those in the U.S. The comparison was done both for occasional travelers and for subscribers with discounts (in Israel, the basis for comparison was the most deeply discounted, Passkal, subscription), for a trip the entire length of the highway, as well as for a limited number of segments. The average dollar price of a trip for a subscriber along the entire length of an American toll road was 3.4 cents per kilometer in 2009. As indicated in the figure, the average dollar-equivalent price for driving the entire length of Highway 6 – even including the southern, toll-free sections – was 82% higher than for the American toll roads. The shorter the trip, the greater the price gap between the countries. The price per kilometer in Israel for three road segments is 117% higher than a comparable trip in the U.S. For a single road segment, the price paid by Israelis is 251% more than in the U.S. – that is, three and a half times the U.S. price. A simple comparison of dollar prices, like the one above, does not take into account differences in the standard of living – which affect the ability to pay tolls – between the two countries. A comparison of the price per kilometer as a fraction of GDP per capita normalizes for the standard-of-living differences and enables a more representative price comparison between the two countries. Considering that the standard of living in Israel is considerably lower than that in the United States, and that the tolls in Israel are higher than in the U.S., the relative burden of driving on Israeli roads is even greater. After adjusting for differences in living standards, the price per kilometer of traveling the entire length of Highway 6 is 3.4 times the price in America. When the comparison is done for a single segment of the road, Israeli subscribers pay 5.9 times as much as their American counterparts. The discrepancies between tolls among occasional users – as opposed to subscribers – who drive short distances on toll roads in Israel and the United States are even greater. (For a trip the entire length of the road, the price gap between countries is similar to that for subscribers.) Even without adjusting for standard of living differences, the dollar price of driving on a toll road in Israel is three times the American price, and for an occasional driver over a single road segment it is 5.3 times as much. When differences in living standards are accounted for, Israeli tolls are 5 times as high for three road segments, whereas an occasional driver traversing a single road segment bears a burden 8.5 times higher than his American counterpart. Since the primary focus here is to highlight the issue of affordability regarding this aspect of Israel’s current transportation infrastructure, these comparisons consider only the relative standards of living in the two countries, and not the relative cost of building roads. That said, the greater the share of labor costs in the construction and maintenance of roads, then the lower living standards in Israel should reduce the relative costs of construction within the country. Over the course of several decades, Israel’s investments in inexpensive and rapid transportation infrastructure have lagged behind those of other Western countries. In the absence of rapid and inexpensive alternatives, Israelis are limited to using only those alternatives that are available in the country. The expensive Israeli toll roads increase the cost of transportation and shipping, which reduce the profitability of Israel companies and reduce their ability to compete with foreign companies. In addition, the added cost is passed along in large measure to the Israeli consumer, who is compelled to allocate more of his/her income for more expensive goods and services. Despite the high tolls on Highway 6, traffic congestion along the road has increased substantially since it opened – primarily due to the lack of better alternatives – and it is has been widened in the sections passing through the center of the country. But in the absence of suitable alternatives, the harm to Israeli producers and consumers will continue, as the costs of not building rapid and inexpensive transportation infrastructure alternatives are rolled over to them.